Continuing the past trend of significant increases in the minimum support price of pulses, the Cabinet Committee on Economic Affairs raised on Thursday those of masoor (red gram) and gram (Bengal gram), the two most sown in the rabi season, by Rs 250 a quintal. A bonus of Rs 75 a quintal has also been recommended over and above the MSP, a total increase of Rs 325 a quintal as compared to 2014-15. CCEA also authorised Food Corporation of India, along with Nafed, SFAC, Central Warehousing Corporation and National Cooperative Consumers’ Federation, to undertake procurement of pulses and oilseeds. Food Corporation of India will be the nodal agency. The MSP of wheat, the biggest rabi foodgrain, has been raised by Rs 75 a quintal, highest increase in recent years. Though the MSP of gram and masoor after the current increase will be Rs 3,425 a quintal and Rs 3,325 a quintal, respectively (without the bonus), this would still be lower than last year’s average retail price of both. Gram in 2014 retailed at Rs 47 a kg; in 2015 till September it was Rs 57 a kg. Masoor was Rs 66 a kg in 2014 and Rs 81 a kg till September 2015. “It is better to give a higher MSP to increase production rather than subsidising foreign growers through increased imports,” said Ajay Jakhar, chairman of Bharat Krishak Samaj, a farmers' advocacy group. An increase in MSP should at least be more than 2015 market prices to make any difference to the growers, he said. Among other crops, the MSP of mustard seed has been increased by Rs 250 a quintal to Rs 3,350 a quintal, and of barley by Rs 75 to Rs 1,225 a quintal from Rs 1,150 a quintal. Safflower's has been raised by Rs 250 a quintal to Rs 3,300 a quintal. The sowing of rabi crops begins in October and harvesting starts from April. 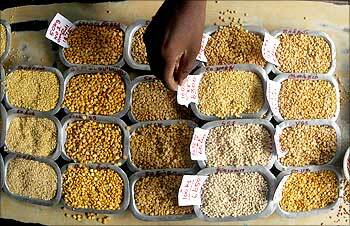 Pulses’ prices, particularly of arhar (pigeon pea) rose to almost Rs 200 a kg in recent months. Production in 2014-15 is expected to drop by 1.82 million tonnes, to about 17.4 mt. Now, get tur dal from Mahindra & Mahindra!